Speaking on Question Time about reports of a coalition row over funding for free schools, commentator Tim Stanley pointed to high ratings and popularity with parents as reasons they might have had funding diverted to them. A survey conducted by the Department for Education found that each place in the free schools that responded had on average 2.7 pupils interested in filling it. This includes applicants placing the school at anywhere up to last place out of the six preferences they're allowed to apply for, so it doesn't quite tell us the full story of how many are putting free schools as their top choice. Without a comparative figure of applications for local authority maintained schools, it also can't tell us much about whether free schools are more popular than their counterparts. The claim that free schools are twice as likely to be regarded as outstanding is backed up by analysis by the New Schools Network, but it's based on just seven free schools which were judged outstanding. The majority of free schools are yet to be inspected so it'll take time for the full picture to emerge. Survey data submitted to the Department for Education by 77% of mainstream free schools shows there were 23,314 applicants naming a free school among the six preferences they are allowed to express, with a total of 8,635 places available. This works out at 2.7 applications per place on average. Out of the 174 free schools that are open, 141 are mainstream, 110 responded and one was excluded because of data issues. So we're missing data for 23% of mainstream free schools, and we don't know if these are likely to follow a similar pattern to those for which there is data. A further 120 schools are due to open this year or later, making up the 300 schools Mr Stanley referred to. The applications figure is the total number of prospective pupils who have (or whose parents have) placed the school among their top six preferences for the academic year beginning in September 2014. Of course, pupils putting a free school last (sixth) on this list are less likely to end up studying there than those who make it their first choice, so it doesn't necessarily mean that these schools are oversubscribed, or even that they're more popular than other types of school. Although the Department asked schools to identify how many of the applications they received ranked them in first place, second place and so on, it has said it is unable to provide the breakdown due to variation in the way schools responded to this question. We've asked the Department if they have any equivalent data for local authority maintained schools, so that we can at least judge whether free schools are proving more or less popular than other schools in these terms. 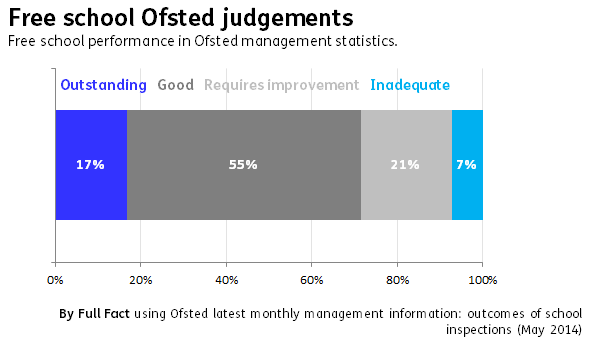 Analysis of Ofsted reports by New Schools Network (NSN) found that Free Schools are more than twice as likely to be awarded an 'Outstanding' judgement under the new "tougher" Ofsted inspection framework (introduced in September 2012). But schools are only required to be inspected by Ofsted within two years of opening, so the majority of Free Schools have not yet been inspected. The NSN analysis takes the first 24 schools that were opened in September 2011 - which, as we've explained before, is a small number from which to draw conclusions. The NSN analysis compares Free Schools inspected between January and July 2013 to all mainstream Primary and Secondary schools inspected between October 2012 and March 2013, using Ofsted statistics. This excludes nursery schools, pupil referral units and special schools. The comparison is therefore between 24 free schools and 4,027 other primary and secondary schools. Taking just those graded outstanding, it's a comparison of just seven free schools (representing 17% of all free schools) to 267 primary and secondary schools (representing 7% of other schools). Ofsted also pointed out to us that many newly-opened schools fill their places gradually, so a secondary free school which opened in September 2013 may only have Year 7 pupils in this academic year, Year 7 and 8 pupils in September 2014, and so on. These schools still get inspected, but it means that the sample on which it is judged is still quite limited. Since the analysis by NSN, Ofsted's monthly management release shows there's now been a total of 40 free schools inspected - which is still a fairly small number upon which to base any conclusions. The proportion graded outstanding remains the same, but the proportion rated inadequate has increased from 4% to 7%. Ofsted told us the management information used in these releases only contains inspection reports published by 1st May 2014, which tend to slightly under-represent inspections with negative outcomes - since they take longer to go through Ofsted's checking process. The sample of free schools we currently have might therefore not only be small, but may also include a higher number of better-performing schools. The time frame used in this analysis is also contentious. Ofsted doesn't draw a distinction between those schools that were inspected before or after it changed its framework, and looking at the most recent reports for all mainstream schools shows that 18% were outstanding, 60% were good, 18% required improvement and 3% were inadequate. This would suggest that there performance was similar to free schools, although the basis of this comparison has been challenged by commentators. As it stands, it is still too early to make judgements about how free schools are performing in Ofsted inspections compared to other types of school. When we first published this piece, the Department had not yet published their survey results and our analysis was based on data from the survey that the Department had sent us. The survey has now been published so the article has been updated to reflect this. We have also corrected our statement that the survey represented 63% of the total 174 free schools as the survey states that it was only sent to mainstream free schools (of which the total was 141).